Rear Bose speakers sound distorted at higher volumes. Dust cover on speaker has separated from speaker cone. A little 3-5 minute epoxy can repair this problem. Replacement of Bose speaker is not necessary. 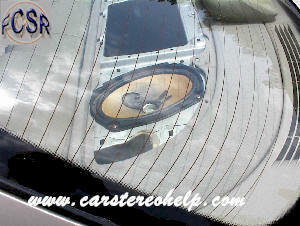 Caution, do not allow epoxy to drip into speaker coil and freeze speaker. This is a free repair we do here at the shop. Good customer relations for a 10 minute job. PHONE (407)830-0777, (800)428-1909 GOT QUESTIONS?